Inventor Andy Noyes’ new creation brings the knitting machine to a new level. The Agnes Roboknit is part mannequin part robotic knitter, which knits on a circular loom with sporadic humanoid movements. Made from homemade gears, Noyes wanted to create a robot that appears to be human from afar, but shows off exposed mechanisms up close. Debuting at the Maker Faire UK, Agnes Roboknit fuses technology with the retro-inspired trend of knitting that has taken over across the globe. The somewhat creepy robot jerks back and forth as she knits each row, looking up from time to time to check how her work is coming along. To create Agnes (named for his grandmother), Noyes himself had to learn how to knit, in order to translate the logistics into mechanical movement. Opting for a circular loom instead of more difficult knitting needles, the robot moves and knits thanks to DC motors that move her joints, which are made from homemade gears. To give Agnes some humanoid recognition, Noyes made plaster casts of a friend’s face and hands. silicone was then poured into the plaster casts, making soft, moveable hands and face. Latex was used to make the robots arms and legs more realistic. Yet Noyes left Agnes’ neck and head mechanisms exposed, to betray her human-like qualities for her true robot identity. Agnes can knit long tubes and scarves, which she showed the audience at Maker Faire. Inventor Andy Noyes� new creation brings the knitting machine to a new level. 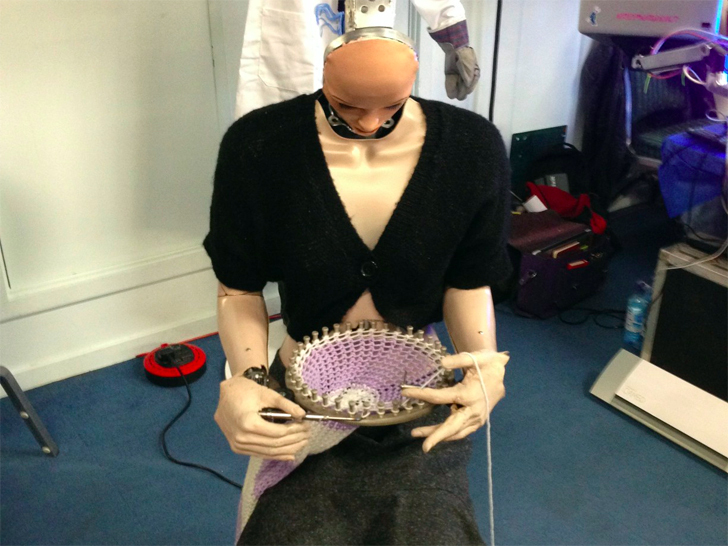 The Agnes Roboknit is part mannequin part robotic knitter, which knits on a circular loom with sporadic humanoid movements. Made from homemade gears, Noyes wanted to create a robot that appears to be human from afar, but shows off exposed mechanisms up close.